I met Tommy’s granddaughter, Carly Perera, in San Francisco. It was our first time meeting in person yet our lives overlapped in coincidental ways. 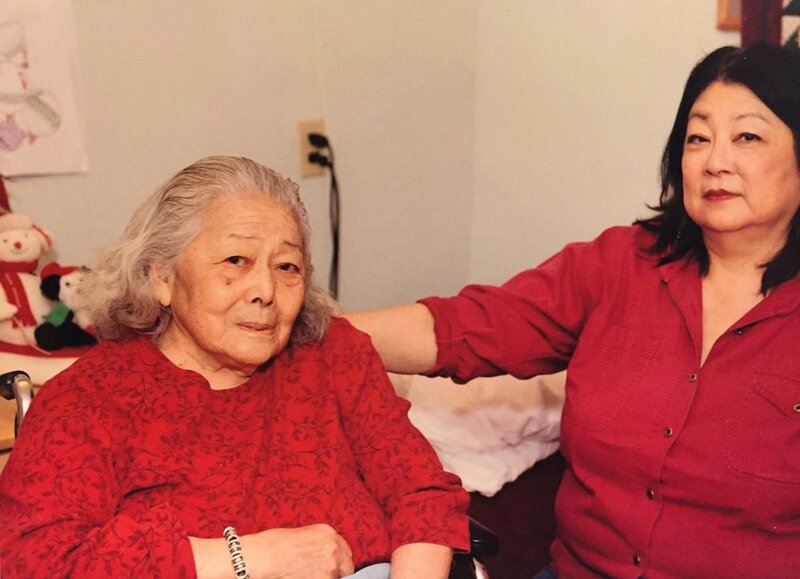 We both were raised in San Jose and were both working on projects to reclaim an unspoken past, piecing together fragments of stories from photos of grandparents who never spoke of their experience in camp. Lucky for Carly, her grandmother kept everything, even the letter that stated that they were going to camp. Tommy kept a diary and wrote nearly everyday, a goldmine for archivists and historians. Tommy was a tomboy, an all-American lady who farmed and played baseball. Carly describes her as blunt and sassy yet graceful and refined. But she had a run-in with tragedy in her twenties. Her first child, Janice, died in camp from spinal meningitis and it would seem as if Tommy would never fully recover from such a loss. Carly describes the abrupt switch in her grandmother’s diary. “All her entries up until then were very boring but after her child died, it was like a valve had broken loose,” she says. The idea of inadequate medical facilities haunted Tommy for the rest of her life: Were the camp conditions to blame, or would she have succumbed to the disease regardless? Tommy was convinced that had they been living a free, normal life, Janice might have survived. As we often see our grandparents as they exist only in their familial role, Carly’s project revealed her grandmother in a different light. She discovered that like herself, Tommy was a woman with her own hopes and dreams, and while they were put on hold, she exuded quiet resilience and grace in the face of insurmountable loss. You can see more photos of her life at @tommykm. What was your relationship like with your grandmother? She was quiet and I think in our family there were things we didn’t talk about and camp was one of them. They didn’t really talk about it. I was close as a grandchild. She didn’t talk about herself that much. My grandfather died a year before I was born, so I just knew her as my grandmother. We didn’t call her bachan actually, it’s kind of interesting. The other half of our family called her bachan and my mom told us to call her Grandma. And she would always sign her cards in quotation marks “Tommy.” She was very American. You can see it in the way she dressed, the way she acted, she was a tomboy. She worked all the time, she danced the Charleston, the way she talked was very American. It was very 1940s proper American. She had a smart mouth back then. So which generation is she? She was born in San Jose. She met her husband Frank in Campbell. They both were Nisei. She worked the land in Watsonville or San Jose. They would go wherever there were crops. How did she meet her husband? I’m still trying to get the story straight on that because he’s a few years younger. 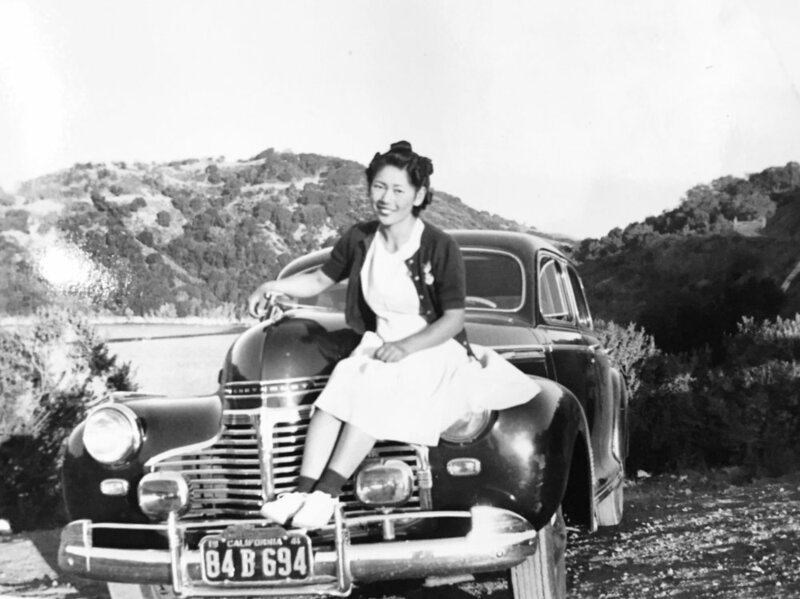 I know my grandmother was a member of the Japanese American Citizens League so I’m thinking that’s where they met. I know they were both supposed to marry somebody else, and they didn’t. Was the marriage frowned upon or were the parents okay with it? I think it was very much frowned upon. And this is all secondhand from my mother but I think that my grandmother did not get along with her in-laws, especially his mother, who was a very harsh woman. Frank’s father was kind of a jokester and I think his mom was very critical of Tommy. For better or worse they were interned very quickly after that and they were separated. Tommy was in her 20s, either 23 or 24. And Frank was two years younger, so 21. I don’t know if he chose what happened but he was interned with Tommy’s immediate family and they went to Heart Mountain. Frank’s family were mostly in Gila River and Poston. They were all spread out. But Frank went with Tommy. And he got along with her family? I’m actually not sure if they got along. When I read her diary it was very much to the point, not really divulging much or herself. I think it might have been a typical marriage in that he went out a lot. 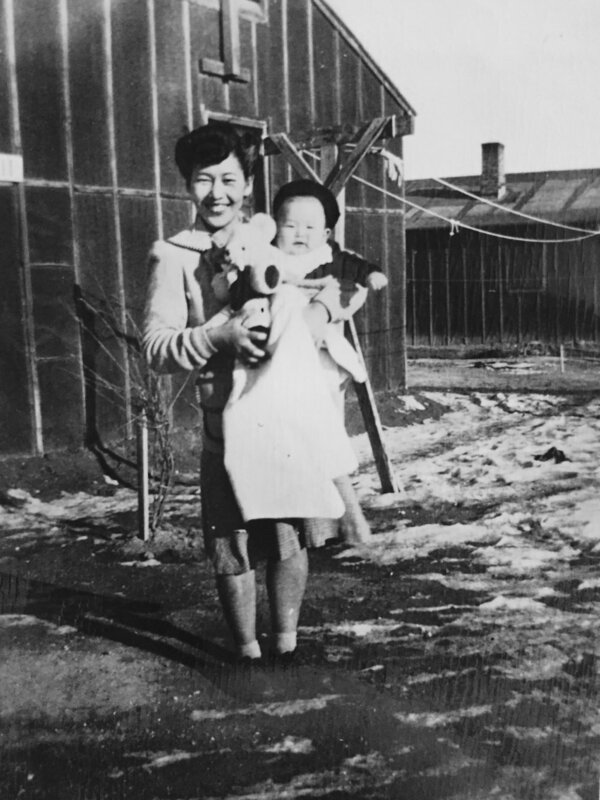 In the camps, it’s such a different way of living. Usually when you marry someone you become a unit and only have one place to live but there, they’re just waiting. And her entries were so boring. “Dry wind, coming from the South.” “Washed clothes.” “Played baseball.” She talks about the long lines for laundry. You see the monotony of every day. But there was a riot that happened in Santa Anita, some kind of uprising. In the diary she wrote that entry in detail, super tiny in cursive. So it was almost the only entry that she wrote that way, and I think it was because of the fear that things would get confiscated. After they lived in Santa Anita, what happened? They took the train from Santa Anita to Heart Mountain, which I think was five days in total. And she would write about these landscapes, and for me I was thinking about how she’s on a train looking at all of these beautiful places that she’s not free to go see. It was kind of heartbreaking to me. Once they were there, it was about a year before she got pregnant with her first baby. And once that baby was born her entires became, “Oh my purpose, my life,” which is what I’m sure what all new mothers feel when they have a baby. Janice was born in 1943. And she became sick four or five months later. Tommy went to the hospital in the camp and they tried to find out what it was. Eventually she declined really, really fast, after about two months. They found out it was spinal meningitis and I’m not sure if she died because there weren’t medical treatments in camp or if it was even treatable, I don’t know. I know that my family told me when I was younger that she died because there wasn’t adequate medical treatment. So I think my grandmother always felt like it was an injustice. When she lost her baby, her diary entries became very long and it was the cycle of grief. Just repeatedly, “I miss my daughter.” It was a good year that she wrote entires like that. First child, first grandchild. When the baby died, Frank was shocked. In his journal entries later he has his mantra of, “I love Janice, I love Janice.” It was sad to see both of them process the loss of this baby. She didn’t talk about Janice actually. I only know about her through my mom. And my grandma had this huge photo of her on her bedside table but it wasn’t something that we talked about. Then Frank missed the birth of his son, his second child. Frank had an injury in his arm and it didn’t get treated so it spread to his hip and he eventually needed a full body cast. He was in the hospital for a year and a half, 1944 through ’45. So he missed the birth and the first year of that child’s life. But I think he also made really good friendships with the nurses in the hospital, so they may have given him a camera so he could see photos of his son. So Tommy had been working ever since she arrived and she harvested sugar beets. There was a sugar beet shortage which sounds ridiculous but it was really important because the men were all responding to the draft so the farm labor was down, and farmers in that region were in a crisis. So I think the idea was kind of like a prison labor camp, where they have these willing and captive people that can be the supply of labor. So Tommy signed up and she was doing what she did. She seemed to be a progressive woman. She would act like any other blue-collar American, like grouchy and feisty in one way but poised and quiet in other ways. I think for me, I never really felt Japanese but that’s because my mother wasn’t raised in traditional Japanese household. I tie it back to my grandmother who very early in her life had to cut ties with that culture. So I can see undercurrents of the Japanese influence in her mannerisms and her ethics, her integrity, but anything else, it’s almost like she had to wipe that away. And in turn we all didn’t get that. I sometimes feel a loss, too. My dad speaks Japanese but never taught us. I’m wondering if that was a product of being in camp, and trying to start over. My mom gave all of us Japanese middle names, it was like a reclaiming thing that happened with our parents. And when was your mother born? In 1951, after camp. My mom is Japanese and my dad is from Indonesia. I almost think that because my grandmother married against her parents’ wishes, and my parents married outside, I’m a product of that. It kind of set a precedent. I went back to Japan this summer and I’ve never been. I felt like a monster. “I have come back, this is what happens when you allow the races to multiply in another country.” And Japan is such a homogenous, controlled, and kind of contained environment. And so I went there and I feel like my movements are too big, I talk too loud, I sweat too much. All of those offensive things [laughs]. How was the experience for you? Did you feel a connection at all? Some things. Their pace of life felt familiar. Like with the way they talk, they talk very slow and measured. You do things slowly and delicately and that’s very Japanese. But I’m very American so I’m moving fast and knocking things around, so I have that side, too. Is your mother passionate about this history or interested in it? I wouldn’t say she’s passionate about it but she’d talk about it. I think ever since I was young I’ve had this lens of social justice and I don’t know where that was fed. My mom isn’t passionate but she’ll tell me stories and she’s very excited that I was finding these photos. She did say, “I don’t know how grandma would feel about her diary being on the internet” [laughs]. I feel like I’m giving her a life and a voice outside herself. I try to keep most of the private details private. What made you want to actually send it out into the world? I think it was that I wanted a way to have this digitally for my family to refer to. And to put this in a trajectory and tell her story because for me, I’m learning so much about my grandmother. When she passed away and we put together this album you’re looking at, I didn’t see my grandmother. I saw this woman who had a life before she was interned and had dreams and had a really great social life and it was suddenly stripped away. So I saw this story of loss, and a story of how she moved on and had a life after that. I did think it was important to share. If you had to pick out one or two things that were the most surprising, is there something you can point to? At the time I wasn’t sure if I was going to stay in the Bay Area and when I saw these photos I thought, wow. My roots are really deep here. And seeing how her and Frank deal with the loss of their child was kind of heartbreaking. All her entries up until then were very boring but after her child died, it was like a valve had broken loose. That was a side I had not heard from her. A side I hadn’t seen.